Here You Can Find The Best Fiber Optic Tutorials! Gigabit network switches connect Ethernet devices in a network while providing great performance capabilities. In many network structures, gigabit Ethernet switches are often used as access switches that connect devices in a local area network. As the pace of network migration is getting fast, the need for gigabit switch with 10G uplink is growing too. And numbers of network administrators desire to apply 1G switch with 10G uplink in their systems. Gigabit switches with multiple port configurations enable the network capacity to expand in consumer or corporate environments. For example, 8 port gigabit switches can provide fast transmission speed for office users, and an 24-port gigabit switch works effectively for small and mid-sized business networks (SMBs). While 802.11ac has changed the way business support the quantity of devices connecting to each other. For network switches in last three years, 10G uplink added significantly to the cost for the switches with less than 48 ports, which isn’t what the customer want. Over the years, gigabit switches in the market usually come with gigabit SFP port. When users want to find one 1G switch with 10G uplink port to speed their networks, they find most gigabit switches with 10G uplink port only exist in 48-port gigabit Ethernet switches. However, not every user needs a 48-port gigabit switch for their applications. But they have to pay for the extra ports which they do not use. Considering this, a multitude of vendors like Dell, FS.COM, MikroTik, Netgear and D-link begin to supply gigabit switch with 10G uplink in the market. Now except for the early 48-port gigabit switch, 8-port, 16-port and 24-port gigabit switches with 10G uplink are available in the gigabit switch market for different size applications. 48-port gigabit switches are the early type of network switches that provide 10G uplink port. And numbers of users are familiar with this switch. Now there is a multitude of 8-port and 24-port gigabit switches with 10G uplink port appear in the switch market, which satisfy users’ demand as well as boom the market. 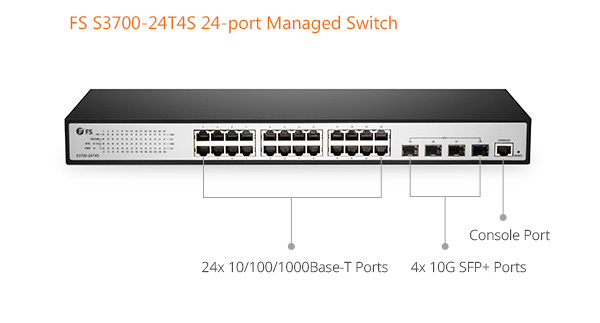 Here are popular 24-port gigabit switches coming with 10G SFP+ uplink port. From the chart we can see, all the gigabit switches listed above provide 24 port 10/100/1000 Ethernet RJ45 ports. Apart from the MikroTik CRS226-24G-2S+RM 24-port gigabit switch that only has 2 SFP+ ports, the leaf gigabit switches come with 4 10G SFP+ ports for uplink to fully exploit the power of 10G servers and storage supporting high bandwidth applications like data backup and replication, and high-volume transaction processing. And they support extensive Layer 2+ or 3 features, enabling them have the same performance as 48-port gigabit switches. In addition, with the 10G uplink port, most 1G switches can realize stacking or uplink, which make the entire network more efficient. Lots of users have complained that 10G links are expensive, thus getting cheaper, but still not cheap. However, from the chart, the price of four 24-port gigabit switches with 10G uplink port above is less than $400, which is really cost-effective for today’s Ethernet networks. Gigabit switches with 10G uplink port can provide high speed data pipes to servers and storage devices. By taking advantage of the SFP+ fiber optic connectivity, those 8-port or 24-port 1G Ethernet switches offer an ideal solution for remote and branch offices. Related Article: What Is SFP Port of Gigabit Switch? This entry was posted in Network Solutions and tagged 1g switch 10g uplink, 24-port gigabit switch, 48-port gigabit switch, 8-port gigabit switch, Gigabit Switch, gigabit switch with 10gb uplink on December 15, 2017 by Chloe Wang. Differences Between Fiber Latency and Copper Latency? Fiber optic communication has development rapidly in recent years. And in many applications fiber optic cable has replaced copper cable for higher speed and higher bandwidth applications. Therefore, numbers of people claim that fiber optic lines have lower latency than copper connections, while others do not think so. Then what’s the latency differences between fiber and copper? Latency refers to a time delay between stimulation and its response. Usually, it’s caused by velocity limitations in a physical system. Put it in simple terms, latency is the time it takes for a signal to travel from one place to another place. And there are diverse types of latency: network latency, Internet latency, audio latency, WAN latency, etc. No mater in a fiber optic network or a copper network, latency can be described as distance and speed. In addition, latency does exist. It’s just a question of fast or slow. One key factor that affects the latency is the signal speed in transmission media. Fiber and copper are two of transmission media. The type of media used in communication system depends on the bandwidth and transmission distance required by the application. As we know, the speed of light in free space is about 3×108 meter per second. While the speed of light in air is slower than that in a vacuum. So does in the glass. Therefore, when an optical signal travels in a fiber link, there are five latency contributors: two are created when the signal moves from the electrical domain to the optical; another contribution occurs as the signal goes through the optical fiber; and as the signal is converted from the optical domain to the electrical, latency occurs. Signals in copper cables are easy to be interrupted by around environments, especially in longer distance transmission. The signals will attenuate as distance increases, which will lead to data transmission error, page error and make users feel slow speed at the moment. Actually the copper cable transmission speed doesn’t slow slow down. Besides, alien crosstalk also would cause transmission errors and latency. 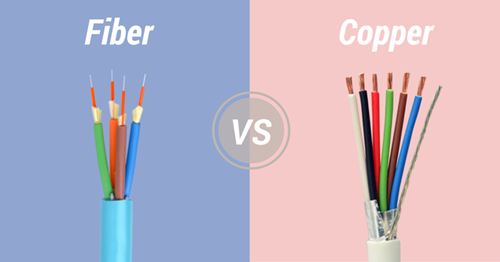 Fiber vs Copper: What’s the Latency Difference? Signals are transmitted at 2/3 the speed of light in fiber optic cables. In copper it can be faster than that. However, this cannot account for system latency. In longer distance, latency in fiber optic system is lower because of less need for processing and repeating of the signals. While signals in copper are affected by electromagnetic interference and are prone to higher rates of loss over long distances. In addition, no mater in a fiber optic network or a copper network, latency can be described as distance and speed. In addition, during the whole transmission process, serialization delay that shows how fast a data pocket can be serialized onto the wire, has far more impact on shorter distances. For example, it will take 8ms to serialize a 1500-byte packet on 1.5Mbps link, while it will only need 1.2us on 10Gbps, or less on higher speed. That shows speed makes a significant difference. In a word, the latency differences between fiber and copper are influenced by transmission distance, speed and environments. For shorter distance, copper cables can be the first choices, for the delay in it does not mean much and its low cost. For longer distance transmission, fiber cable offers lower latency for the whole network and can be an optimal choice. Related Articles: What Is Copper Trunk Cable and How to Use It? This entry was posted in Network Solutions and tagged copper cable transmission speed, copper latency, fiber latency, fiber vs copper, Latency on October 21, 2017 by Chloe Wang. GLC-LH-SM vs SFP-GE-L: What’s the Difference? SFP-GLC-LH-SM and SFP-GE-L are two Cisco 1000BASE-LX/LH Ethernet transceivers. Due to the similar mode and performance such as supporting distance and working wavelength, users are often confused with Cisco GLC-LH-SM and SFP-GE-L when they are choosing these SFP modules. 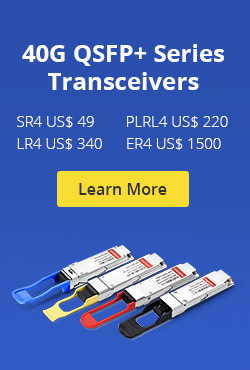 Then, what’s the difference between the two transceivers? This post intends to give a simple explanation of GLC-LH-SM vs SFP-GE-L.
Cisco GLC-LH-SM is a hot-swappable optical transceiver that supports the maximum data rate of 1Gbps. It’s compatible with the IEEE 802.3z 1000BASE-LX standard, and can operate on standard single-mode fiber optic link spans of up to 10 km and up to 550 m on any multimode fibers. SFP-GE-L transceiver has many similarities with GLC-LH-SM transceiver. It is also a Cisco 1000BASE-LX/LH Ethernet transceiver that designed for Gigabit Ethernet applications. This 1000BASE-LX/LH SFP, compatible with the IEEE 802.3z 1000BASE-LX standard, and can operate on standard single-mode fiber optic link spans of up to 10 km and up to 550 m on any multimode fibers. Notes: no matter GLC-LH-SM or SFP-GE-L modules, mode conditioning patch cables are required when they are used for 1000BASE-LX/LH applications over FDDI-grade, OM1, and OM2 fiber cables. From the Cisco official notes, Cisco original GLC-LH-SM SFP and SFP-GE-L transceiver have been no longer for sale since March 8, 2013. But this doesn’t affect the market of these two SFP modules. Many users still choose to use them. As mentioned above, GLC-LH-SM and SFP-GE-L are easy to be confused. In fact, it’s not difficult to tell from them. The first big difference between the two SFP modules is SFP-GE-L SFP supports DOM (digital optical monitoring) while GLC-LH-SM module doesn’t. DOM is an important function available on fiber optic transceiver. It allows users to monitor parameters of modules, such as optical output power, optical input power, temperature, laser bias current, and transceiver supply voltage, in real time, offering users more convenience when using optical modules. Another difference is the operating temperature range. The temperature range of Cisco GLC-LH-SM SFP is 32℉to 158℉(0℃ to 70℃), while the extended operating temperature range of SFP-GE-L module is 23℉ to 185℉ (-5℃ to 85℃). GLC-LH-SM vs SFP-GE-L: Which One to Select? From the contents above—GLC-LH-SM vs SFP-GE-L, we can draw a conclusion that both of them can be used as the same one type module sometimes, but their existing differences still differ them from some applications. For example, the WS-SUP32-8GE-3B does not support DOM SFP modules like the SFP-GE-L while supporting GLC-LH-SM SFP. Therefore, buying the suitable one for your devices when choosing from the two modules. As noted above, these two modules are end-of-sale in 2013. However, FS provides these two modules at a cheap price. And other types of compatible optical transceivers such as GLC-LH-SMD are available too. Every optic module in FS is 100% tested to ensure fully compatible. More details, please visit www.fs.com. Which One to Select, GLC-LH-SM Vs GLC-LH-SMD? This entry was posted in Fiber Cabling and tagged glc-lh-sm, GLC-LH-SM SFP, GLC-LH-SM vs SFP-GE-L, sfp-ge-l, SFP-GE-L SFP on October 14, 2017 by Chloe Wang. As the continuously increased bandwidth demand, the types of fiber patch cable are also updating quickly. OM5 fiber cable, also known as WBMMF (wideband multimode fiber), has arrived to meet the growing bandwidth requirements. However, there are different opinions on whether the adoption of OM5 fiber will benefit today’s data center. This post will focus on the advantages and disadvantage that OM5 brings for data centers. With the cloud computing and web services continuing to drive bandwidth need, data rates grow from 10G, 40G to 100G and beyond in many data center networks. According to the Cisco global cloud index, nearly 99 percent of global traffic will pass through data centers by 2020. That means higher bandwidth, faster services and greater access are required for data center deployments. Therefore, advanced technologies including fiber patch cable and optical transceivers will be needed for performance-improving in data centers. Will OM5 Fiber Benefit Data Center? OM5 fiber is a new generation of multimode fiber. It was just standardized in several months ago. Different from OM1, OM2, OM3 and OM4, OM5 fiber is designed to work over a wide range of wavelengths between 850 nm and 950 nm. And it supports SWDM (shortwave wavelength division multiplexing) technology which can reduce fiber counts in optical transmission. Here are the advantages and disadvantages of OM5 fiber optic cable in data center. Firstly, it cannot deny that the emergence of OM5 is to meet the high bandwidth challenges. At this point, OM5 will definitely benefit data centers in some degree. The main advantages are in the following part. Compatibility—OM5 cable has the same fiber size of OM4 and OM3, which means OM5 is fully compatible with OM3 and OM4 fiber. In other words, OM5 cabling supports all legacy applications in existing data center infrastructures. If a service provider wants to use OM5 for high speed data center, big changes will not be needed for existing cabling. 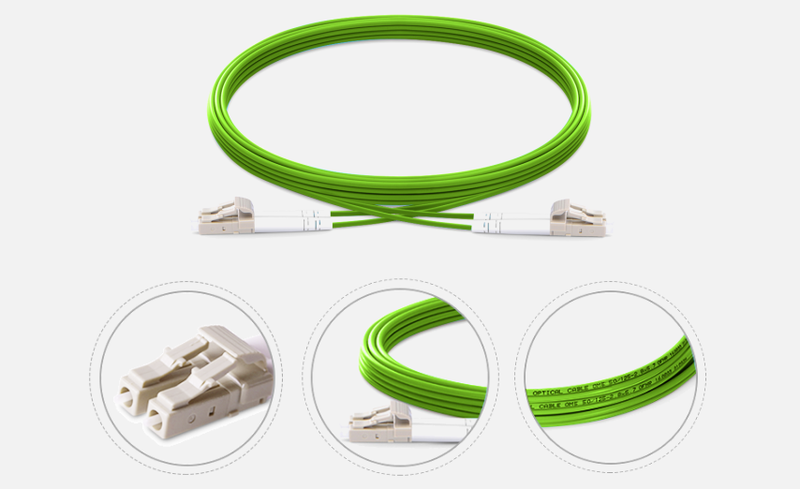 Distance—multimode patch cord is often the first choice for short reach connections. As we know, OM4 patch cord can support link length up to 100m with 100G-SWDM4 transceivers. While OM5 can extend the reach to 150m with the same types of fiber optic transceivers, providing another better choice for data center optimization. Cost—when it comes to data center building, the cost is an important parameter to consider. OM5 cable is beneficial for data center deployments. 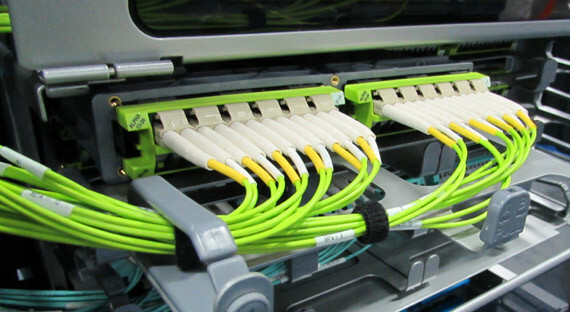 Compared to single mode fiber cable (SMF), multimode fiber cable (MMF) is more cost-effective, because in most data centers, short reach connection are common. Besides, OM5 provides optimal support of emerging SWDM applications which reduce the amount of fibers needed for high speed transmissions. Each coin has two sides. Though OM5 fiber cable can benefit data center building, there are still some problems at present. It’s known to us that OM5 has just been standardized earlier this year. Even though many optical vendors have introduced OM5 fiber patch cables, in the market, the price is a little higher than OM4. And the production of the corresponding optical transceiver like 100G-SWDM4 is still limited. All these restrict the further adoption of OM5 fiber cables. It’s getting more costly for fiber optic cabling systems in data centers. As a new MMF type, OM5 offers improved performance over popular OM4 and OM3. With the development of OM5 technology, it will bring more benefits for data centers. This entry was posted in Fiber Cabling, Fiber Patch Cable and tagged om5, om5 fiber, OM5 fiber cable, om5 fiber optic cable, SWDM, WBMMF on July 29, 2017 by Chloe Wang. How to Realize 16 Channels Transmission in DWDM Network? DWDM MUX/DEMUX plays a critical in WDM network building. 16 channels transmission is very common in DWDM networks. How to realize it in a simple way? This article intends to introduce two solutions to achieve 16 channels with different types of components. Which one is more cost-effective and competitive? The comparison between the them also will be explored. Hope it will help you when choosing fiber mux for your DWDM networks. In order to illustrate the solution more clearly, I take two types of DWDM MUX/DEMUX as an example. One is the traditional 16 channels dual fiber DWDM MUX/DEMUX. Another is two FMU 8 channels dual fiber DWDM MUX/DEMUX. The latter has an expansion port. The 16 channel DWDM MUX/DEMUX is a passive optical multiplexer designed for metro access applications. It’s built fiber mux and demux in one unit and can multiplex 16 channels on a fiber pair. In addition, this type of fiber mux also can be added some functional ports like expansion port, monitor port and 1310nm port, which make it possible to increase network capacity easily. The following is a simple graph showing the 16 channels transmission with this traditional DWDM MUX/DEMUX. The FMU 8 channels DWDM MUX/DEMUX provide 8 bidirectional channels on a dual strand of fiber. Usually they are used together. Unlike the 16 channels DWDM MUX/DEMUX, this FMU 8 channels one has a more compact size, for it only occupies half space in a 1U rack. Put two FMU 8 channels DWDM MUX/DEMUX modules into one 1U two-slot rack mount chassis. two 8 channels DWDM MUX/DEMUX with different wavelengths are connected through the expansion port to realize 16 channels transmission in a DWDM network. Here is a graph showing how to achieve 16 channels DWDM transmission with these two 8m channels fiber muxes. As shown in the figure, two 8 channels DWDM MUX/DEMUX with different wavelengths are connected through the expansion port to realize 16 channels transmission in a DWDM network. 16CH DWDM MUX and Two FMU 8CH DWDM MUX: What’s the Difference When Deployed? From the content above, we can see both solutions can realize the 16 channels transmission in a DWDM network. Then, are there differences between them? Or which is more competitive? Here is a simple analysis of the two solutions. Firstly, comparing the two graphs above, the FMU 8 channels DWDM MUX/DEMUX are connected together by an expansion port, that’s why it can deliver 16 channels services like the traditional one. 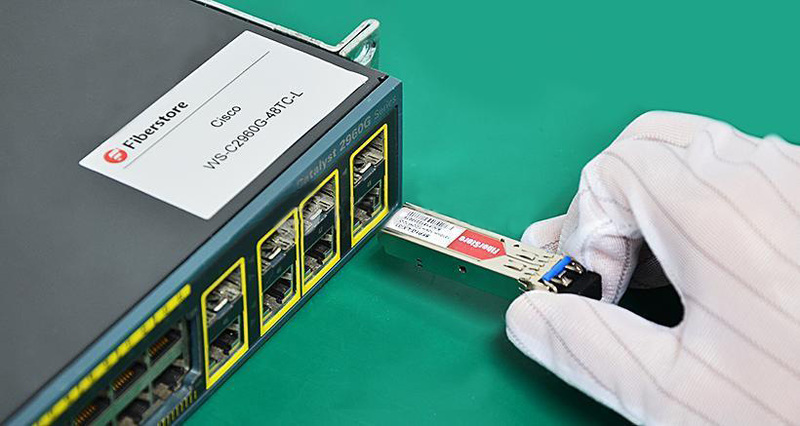 Except for connecting 8 channels DWDM MUX/DEMUX, the FMU fiber mux with expansion port also can be combined with other channels fiber mux like 2 channels, 4 channels or other channels, which offer more flexibility for optical network deployment and upgrade. And you can add DWDM into CWDM networks at some specific wavelengths with FS.COM FMU fiber mux. Secondly, DWDM MUX/DEMUX price is always an important point that many network operators pay attention to. Therefore, when buying a fiber mux, the cost is a critical point to consider. If you search on Google, you will find the lowest price is $1100 in FS.COM. And the cost of using two 8 channels MUX/DEMUX is the same as the deployment of one 16 channels MUX/DEMUX. 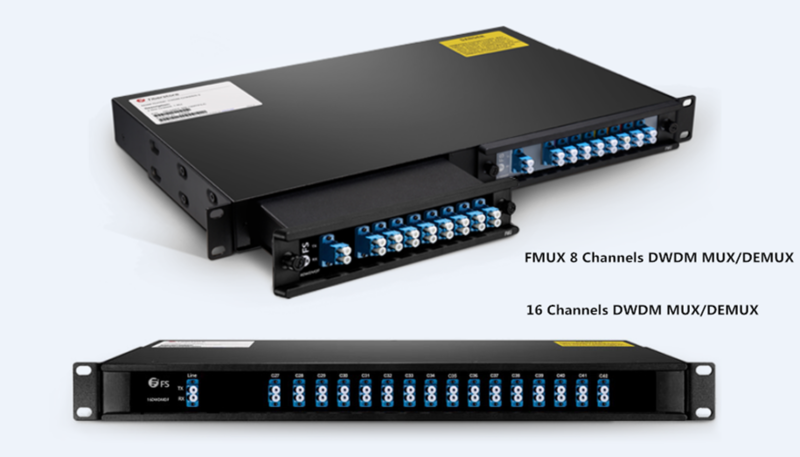 However, compared with the 16 channels DWDM MUX/DEMUX, the FMU 8 channels fiber mux provides a competitive solution for small networks which needn’t to buy a full-channel fiber mux that supports all 16 channels or more channels. 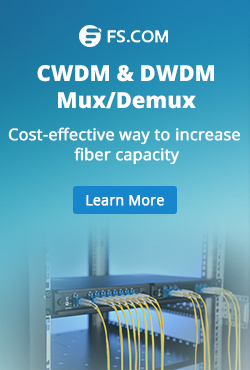 From the comparison above, the FMU 8 channels DWDM MUX/DEMUX is more flexible and cost-effective when deployed in WDM networks. How to choose is based on the requirements of your networks. FS.COM supplies two different types of these WDM MUX/DEMUX. Here is a simple datasheet of them. If you have more requirements for additional wavelengths, welcome to visit www.fs.com for more detailed information. This entry was posted in How To, WDM Optical Network and tagged 16 channels DWDM MUX/DEMUX, 8 channels DWDM MUX/DEMUX, DWDM MUX/DEMUX on May 27, 2017 by Chloe Wang. How to Upgrade Cumulus Linux on N-Series Switches? Why 25G Ethernet Switches Are Still Necessary? Copyright © 2016 fiber-optic-tutorial.com. All Rights Reserved.